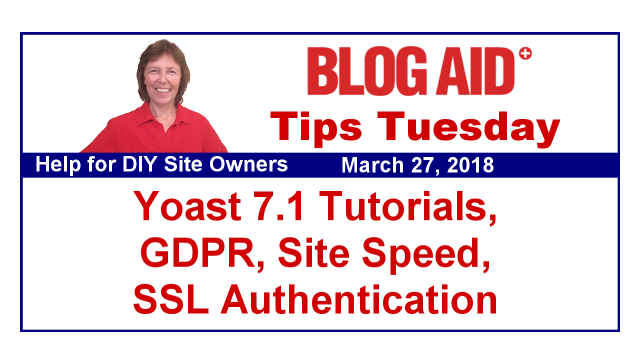 I’m delighted to say that I think it’s safe for us to upgrade our Yoast SEO plugin to version 7.1 now. And I’m thrilled to announce that all of the affected tutorials in the DIY SEO course that were affected have been updated too. There are 12 new tutorials that take you through all of the new labeling and settings. Plus, I reorganized the tutorials to help you find the new sections things are in too. And that’s just one more reason why a subscription to courses like this is worthwhile, because they keep up with the changes. I’m really looking forward to meeting with my DIY SEO members on Thursday for our last live workshop this spring. It’s on special formatting to help you get more of your posts seen in Google Snippets. This is a HUGE deal now, especially with voice search becoming so popular. I know my posts that have been featured that way have sent tens of thousands of folks to my site. So, this will be a big boost to get in on. In fact, I have one Scratch to Published client right now that is building a whole new site with the express goal of getting every post they’ve got into those snippets. Yep, it’s that big a deal. Folks in my member sites were so understanding with the hoohaa caused by a change of setting that I made at Cloudflare which kept them from gaining access to the tutorials for a bit. 24 touches on the support ticket with Cloudflare later and we not only identified the setting, but I got some clarity on the root cause. You see, the way it has to be set up is for the root domain of blogaid. And any changes I make to that flow down to the sub-domains for the member sites, like learn.blogaid.net and webmaster.blogaid.net. Those new settings worked great on my test sites and on BlogAid itself. But, they didn’t work well on the sub-domains. Cloudflare support has been either doling out crumbs of info at a time, or running us in circles because the first available person answers the ticket, instead of reading the whole thread. So, today I’m having a paid consult with someone who manages Enterprise level accounts on Cloudflare for both speed and security. That’s two rungs up the ladder from the types of settings you and I handle on the Pro account level. He has experience with the unique needs of member sites as well as e-comm sites. So, I’m hoping to get to the bottom of this a lot quicker than what I’ve been through with Cloudflare support. I’m also going to run by him all of the other setting recommendations I came to during my tests, that I proved sped up sites radically, and ensure they are good to go before I make the Webmaster tutorials too. I’ll likely wait another week before I make any changes, though, as I know folks will need access to the new tutorials I’m putting up for Yoast and the Workshop this week, and I don’t want to take any chances on disturbing that. Of course, all of this has put me a couple of weeks behind in getting to the client site speed tests I want to run prior to opening that ultimate speed service for BlogAid. In the meantime, I’m working as fast and hard as I can go on the waiting list of site audit clients. A couple of the jobs I’m doing right now are cleanups on sites that have been around for about 10 years and have moved to a lot of hosts and tried all manner of plugins. That leaves a lot of junk behind. And there are a lot of base settings with security and performance to change because a lot of hands have been in the pot. So, these are taking longer to do, but well worth it!!! We’ve already closed major security holes that were causing spammers to have access to the site they shouldn’t, and also causing hosting overages that keeps shutting down the account. Not to mention that they are already running faster too, and that’s just from the security and plugin changes. We haven’t even gotten to the real speed stuff yet. So, if you’re thinking about getting your site squared away and speedy, now is the time to get on the waiting list. I’m getting booked up solid for April at this point. And you don’t want to miss that July deadline Google set for speed being and SEO ranking factor. Nor do you want to get left behind when all the competitors in your niche are jumping on the speed wagon and suddenly your site is the slowest of them all. That’s all the news from around here, let’s jump into this week’s tips. The Automattic devs are already working on WordPress version 4.9.5. They are talking about putting a call out notice in it to give the Gutenberg plugin a try. And tell every blogger you know, so they don’t click that invitation either!!!! I’ll remind you again when we get closer to the release. Gutenberg won’t be rolled into the WP core until version 5.0. And even then, we are not going to make use of it. We are going to get the Classic Text Editor plugin, or keep using TinyMCE Advanced, and go on like nothing happened. I doubt we’ll be making use of Gutenberg until at least 2019 because it will take that long to get fully compliant themes and plugins for all the functions we use now. Just make sure that all of your blogger buddies know what’s going on with it, because it’s coming soon. Send them to Tips Tuesday to keep up with the news. The beta release of 4.9.5 is scheduled for April 3rd and we’ll see if it has this call out for Gutenberg in it then. One of the next big cyber security attack vectors is going to be spoofing SSL certificates. Basically, thieves want you to believe that you’re on a secured site so that you give them all manner of personal info, which they can steal, or use against you in other ways. I want to thank webmaster Timothy Sweeney of Peak Ecommerce for the heads up on a new Certificate of Authority post that addresses this SSL certificate spoofing concern. I’m going to read up on it and see how to implement with Let’s Encrypt, which is the free SSL certificate from our host that most of us are using. But, we’re also using the free SSL cert issued by Comodo if we’re on Cloudflare, and that’s the one the visitor’s browser reads. Plus, we have to factor in AutoSSL from cPanel at our host, which is the thing that auto-renews our SSL cert every 90 days. So, there’s a lot in play with implementing this new authentication method. Why Pay for HTTPS Conversion? All of my HTTPS conversion clients are on a private email list. I keep them updated for any changes they may need to make, or when things role out like this new SSL certificate authentication method. Plus, I provide the tutorials for how to make the changes themselves. Folks, this HTTPS related stuff changes every day. I kid you not!! All of the entities involved are making it up as we go. That’s just one reason to have a partner for your long-term site success that empowers you, as a DIY site owner, to keep up with the changes. And if that’s not reason enough, here are 10 more reasons not to use the free way full of tricks to switch to HTTPS. As you have likely heard, mobile-first indexing is coming to Google. They now consider the mobile version of your site as your primary version. That is also why speed, speed, speed is so important now too. SEO Roundtable has a post about the email Google will send you when they have ported your site over to their new mobile-first indexing. These emails are coming from Google Search Console. You do have your site connected to Search Console, right? And all property versions of it too, right? If you did the free way of HTTPS switch, I’m betting this got missed. As well as updating your XML sitemap and such too. If you’re wondering what the mobile-first index is, SEO Roundtable has a post on that too. In site audits I generally flag about half of the plugins in use as being either security issues or resource hogs. The folks at WPMU Dev have a list of some of the worst offenders. And here’s another list from my buddies at Freelancer Tools too. Go check them and see if you are using any of those plugins. And yes, Contact Form 7 is on both lists. During my speed tests, I found out why. Plus, the thank you page redirect no longer works without another plugin or code added. So, I’m thinking this plugin, which has worked so well for so many years, may be a dinosaur that needs to go now. I’ll be looking into alternatives for us as soon as I can put that on my plate. You know I’m going to test them thoroughly!!! I certainly hope you took our Seriously Old Plugin Challenge back in May to update your site to PHP7. We are in a fuzzy area now where a plugin update could give you the white screen of death, or break some other aspect of your site due to an incompatible PHP version. The folks over at Delicious Brains has put a call out to all plugin devs to simply drop coding that includes any version of PHP below 5.6, as none of them are supported by PHP itself and carry a huge security issue. Hosts and WordPress itself are both pushing for adoption of PHP 7 now too. So, the rope is getting pulled tighter the longer we go, and I don’t want to see you inconveniently break your site over this. If you don’t know what’s going on, or what I’m talking about, see this post on How and Why to Switch to PHP 7. It was initiated for European countries, but affects U.S. based online marketers too. The MarTech Today site has a must-read post for all bloggers and online marketers who collect email addresses, or other info about their visitors. I want you to pay special attention to the last few paragraphs about your segmented email lists. If folks sign up for one thing, you are no longer allowed to put them into your general list without expressed consent from them. That thrills me to no end because I’m sick of signing up for something and then being subscribed to other email lists from that same company where I have to unsubscribe from things I never signed up for in the first place. I’m also sick of marketers uploading their email lists to Facebook for the sole purpose of creating an ad look-alike audience, even when the privacy statement on their site says they will never share or sell their list. By uploading it to Facebook, they are breaking their own policy. I hope the GDPR regulations put a stop to all of this. And if you are participating in these practices, you better rethink them and how you use your optins and lead magnets. That’s especially true in the wake of the whole Facebook privacy hoohaa going on right now. The GDPR rules go into effect May 25, 2018. Share this post with all your blogger buddies to support all the free info and help you get on BlogAid. And a big thank you to all who do!! Good post! I’m glad they’re cracking down on the email subscriptions too. Like you I’m tired of subscribing for one thing and then ending up getting all sorts of things I’m not interested in. Well, they are cracking down on it for EU citizens. Hope that culture spreads to the U.S. too! !